This San Francisco duo, much praised for their awe-inspiring live sets and loop-heavy soundscapes, have taken their sonic vision to the next level. After three years of experimentation within their performance, both on-stage and in the studio, the band has developed their craft into an art form. Tartufi welcomed engineer and co-producer Tim Green back into the control room and spent over four months recording and mixing what has become their most ambitious work to date. Further exploring the boundaries of vocal and instrumental layering, poly-rhythmic deconstruction and song arrangement, Nests of Waves and Wire is a lush and weighty mix of the band's compositional sensibilities and sonic capabilities. Having created a sound both entirely refreshing and wholly vital, the momentum behind them shows no sign of slowing. Sounding like a 10-piece band backed by a full choir, NOWAW is a refreshing breach within the realm of today's popular music. All music written and performed by Tartufi. 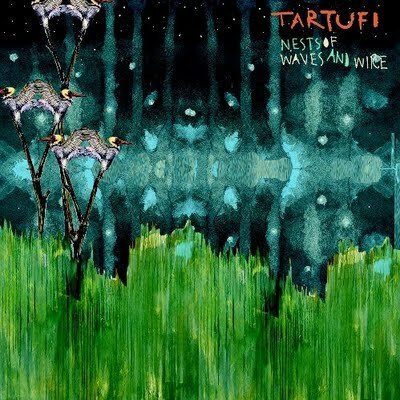 Copyright 2009 Tartufi and Southern Records. Produced by Tartufi and Tim Green. Mixed by Tim Green and Tartufi at Louder Studios. Recorded in the Spring and Summer of 2008 at The Hangout Studios in Sacramento, CA and Louder Studios in San Francisco, CA. Mastered by John Golden at Golden Mastering, Ventura CA. Tartufi is a proud member of Thread Productions. Album art and desgin by Jessica Trippe.